SKU: n/a. Category: Caterpillar & Chrysalis Kits. Tags: Butterfly Experience, Chrysalis, Pupa. 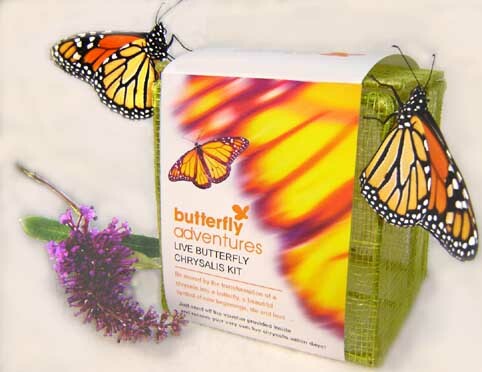 In its current form, The Chrysalis kit is a unique product invented by Butterfly Adventures. 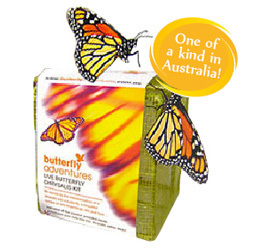 Give your significant others the experience of having a chrysalis turning into a gorgeous butterfly. 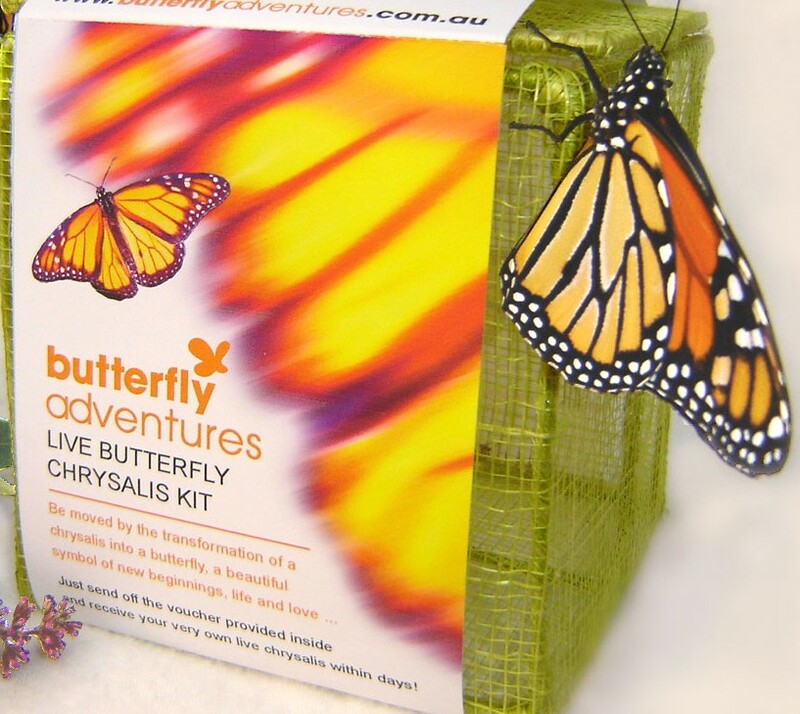 This butterfly hatching kit is perfect for weddings, birthdays, housewarming gift, as a powerful healing symbol, or as a unique romantic gift. The Chrysalis kit is perfect for the classroom. Studying Minibeasts unit and the Butterfly Life Cycle has never been so much fun. 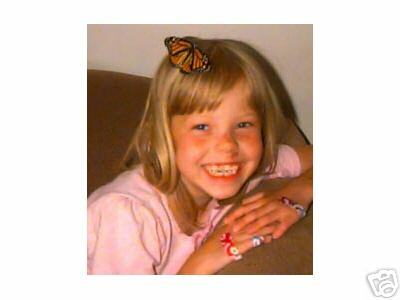 Butterflies are probably the only insects that all kids strongly relate to strongly and positively. The butterfly life cycle is a perfect example of the insect full metamorphosis with an egg, larva (caterpillar), pupa (chrysalis) and the adult butterfly. If you need curriculum based activities, we have put together chrysalis kit related lesson plans for every level. 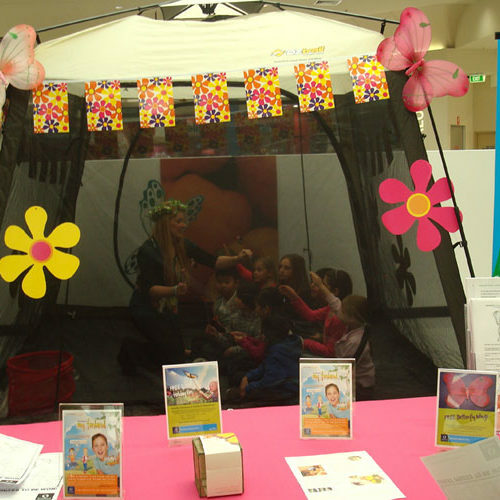 Your butterfly will emerge from the chrysalis within 4-12 days depending on the temperatures in your room and during the transit. We deliver everything via AusPost Overnight Express or overnight courier. This is because we are sending you delicate material and need to minimise the transit time as much as possible. This does not mean that we can dispatch your order immediately…. While we will try to send your items as quickly as possible and as close as possible to your selected date, chrysalises have a very limited shelf life and we can keep only a few of them in stock. We are kindly asking you to please allow up to two weeks for delivery. We use AusPost and Tall for overnight delivery to minimise the time in transit. Will I always get the same chrysalis? We will try to send you the Monarch chrysalises (see images below) when we can but, at different times of the year there are limitations in availability and we will send the species available at the time. So the butterfly hatching kit may come with chrysalises of very different textures shapes and colours: green or brown, smooth or slightly spiked and some can even wriggle! Please let us know, if you only want a Monarch but this could mean a longer wait. 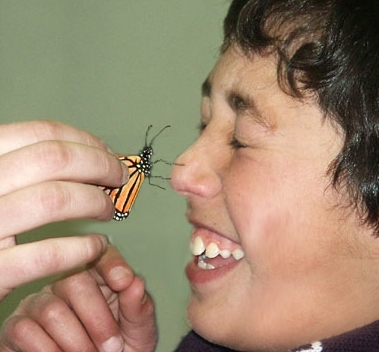 A birth of a butterfly, like a birth of any living creature is a rather delicate process. We wish we could say that there is 100% guarantee of success but that would be unrealistic. What we can guarantee, however, is that we will be there to answer your questions, support you and in a rare case of the birth going wrong to replace your chrysalis. 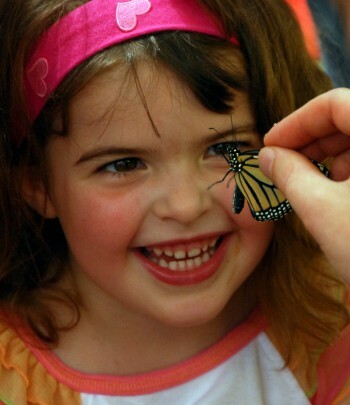 Kids of all ages will enjoy a close encounter with butterflies, a truly unique experience!